You asked: What is the monitoring process like? What happens before and after the elections day? Where do votes go after the election? What is the flow of what happens on the day? What do I do at the polling station? Let's talk about the role of the EC / SPR. Does the PM call for elections? Technically only the Elections Commission / Suruhanjaya Pilihan Raya can call for elections. But they can only issue a writ for elections to be held once the parliament is dissolved. And the Agong dissolves the parliament based on the Prime Minister’s request. The Parliament can also be dissolved if there is automatic dissolution five years after its first meeting, or a motion of no-confidence (this has never happened in Malaysia before though). So the PM has a lot of say in terms of when elections happen. These days, thanks to how power is concentrated in the executive, the narrative has been simplified to 'the PM calling for elections'. State legislative assemblies (DUNs) usually will be dissolved after Parliament's dissolution, though it doesn't have to be so. Sarawak, for example, holds its state elections separate from general elections. EC runs elections for state as well as federal. Once elections day is known, there’s a sigh of relief around the nation. People can now plan their leave, sort out their balik kampung travels. For people who vote in Sabah and Sarawak, they will have to figure out if there is enough money for a ticket to fly back to vote. But at least everyone knows what day they’re working towards. And we arrive at nominations day! Nominations day is when political parties reveal / announce who is going to run on their ticket. Political parties send their candidates to nomination centres to submit forms and pay a deposit for their candidacy. Each candidate nominated by their party needs to bring a certification letter (watikah) from the party confirming they are the legit nominee. There’s only one watikah per political party, per seat. Without the watikah, you can’t run for a seat. This avoids a party flooding a seat with their nominees. Independent candidates can also submit their forms. After nominations there’s a period of campaigning. How long for? Technically, campaigning period should only happen after nomination until the midnight before polling day. Usually this period lasts about two weeks, but there was one time where it was just eight days, which is really little! The number of campaigning days has gone down throughout the years, from a high of 42 days in 1955. But there’s actually nothing in law that says how many days campaigning period should be. It’s totally at the hands of the EC, as long as it can declare the winners within 60 days from issuing the writ for elections to be conducted. We can define it as explicit endorsement of political candidates and parties. Basically, every time a politician makes a statement about why they deserve your vote, it counts as a campaign. During campaigning period, people can put up flags, posters, and banners to create awareness about their DUN nominees or parliamentary seat nominees and why you should vote for them. For obvious reasons, this period is most exciting for political party members or people: there are ceramahs, candidates going door to door, people canvassing, putting up buntings. Sometimes they try to make funny publicity stunts like a big dacing, a big rocket, a big bulan. This is the time for you, a voting citizen, to check out who’s on your ticket. Get to know the nominees who will appear on your ballot, because one of them will represent you and your area for the next few years. If you don’t know who they are and their stand on issues you care about, this is the best time to find out. Let's talk about the actual voting process on elections day. OK, now campaigning is done, it's elections day and it's time to go out and vote! Even if you've made an informed decision about who you're voting for, first-time voters have some anxiety considering the big day, especially if you're going alone. So remember to this page with someone who could use it! Here’s what you should do before leaving the house! Get ready to be there early! This beautiful doodle is by Marissa Voo! She also made a Mandarin version here! 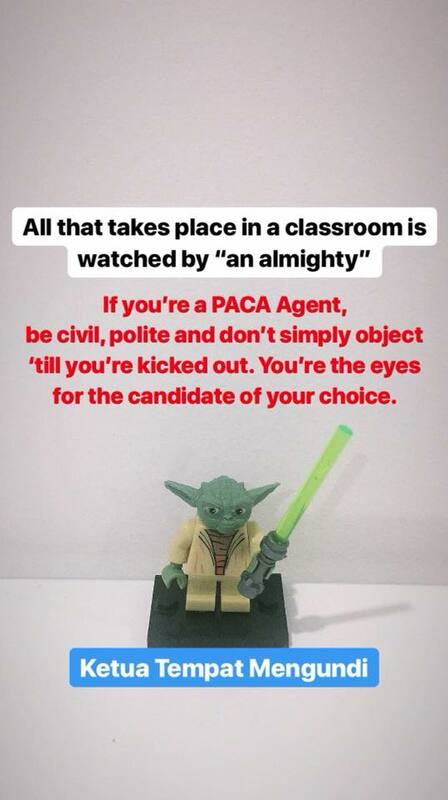 Joanne Tay on Facebook signed up for PACA training and shared this fantastic Instastory series about every step you take in the voting classroom— using Lego. She's volunteered to be a PACA agent in GE14! Go to the Barong SPR to check your polling stream (saluran). You can head straight there if you already know— eg. Saluran 1 is always for warga emas. Enter the polling booth when permitted by the police. You’ll see three people, the Kerani Pengundian. The first kerani wants to see your identification and check that your hands are clean. The second kerani will apply indelible ink on your index finger. Then your name will be called. The third kerani gives you your ballot papers (voters in Federal Territories get only one ballot each) and you proceed to the voting booth. Mark a clear X in the empty box next to your chosen candidate. Keep it simple and clean, and don’t get any indelible ink on it! Place the ballot paper into the corresponding box (Parliament or DUN) and leave immediately. And here's a great video by young Sabahan voter Adam who recreated the voting day process in the last elections for beginners! (Check the video description for amendments since then). After voting begins the counting. The votes are tallied in each polling stream and recorded in Form 14. The boxes are then sealed and sent to the voting tally centre. Any discrepancy in the counting process needs to be resolved by a recount. This can happen at the polling stream or at the tally centre. The EC also grants accreditation to some organisations to be official observers (pemantau) for the elections. Observers supervise the elections process outside the polling centres during the election period. Merdeka Center, who we work closely with, have received these credentials before. If you have experience observing several elections, you might even be invited to monitor elections in other countries, eg. through The Commonwealth Observer Group or regional group ANFREL. This year, Malaysia invited 14 countries to send observers for our elections. Among those who said yes: Indonesia, Thailand, Maldives, Timor Leste, Cambodia, Kyrgyzstan and Azerbaijan. After the votes are counted at the polling stream itself, and after the tally is done at the tally centre, what next? They count the winning candidates from each party or coalition. The party / coalition who commands the support of the majority is able to form the government at federal level or state level. The EC will officially announce the winning candidates. Usually there won’t be surprises here, since political parties have their own unofficial tally from the counting process. Okay, so after the election results are out, it’s time to form a federal government. You do so by winning simple majority: 112 out of 222 seats— just over half. The winning coalition or party approaches the Agong (or the Sultan at the state level) and tells them. But what if Party X wins 100, Party Y wins 80, and Party Z wins 40? Without a clear majority, we have a hung parliament (or a hung state assembly). If the biggest winner of the seats can’t even win half the number of seats, it isn’t good news. A hung parliament also happens when big blocs don’t go out to vote, which is also bad news. There's never been a hung parliament before in Malaysia though. To solve this problem, other parties can be invited to join and form majority (eg. BN's 45% + PAS for example = federal government). But this comes with many compromises, which makes policymaking even more mixed, unclear, and out of our hands. So a hung parliament can’t empower us. If anything, it only empowers smaller parties who are also willing to make a deal with whoever needs them most to get lawmaking power. If it helps to save this image in your phone, do it! Hopefully now you know a little more about what’s going on, and that you feel more ready to face all the election fever coming our way and look it in the eye. Test yourself with this super cool visual link from The Straits Times and see if you understand most of it! It covers material we've touched on in all three of our episodes so far. And now you're done with Part 3! What next? Tempted to ignore all this ‘politics stuff’ and just focus on your hustle? In our next thread, we’ll talk about why this backfires on you. 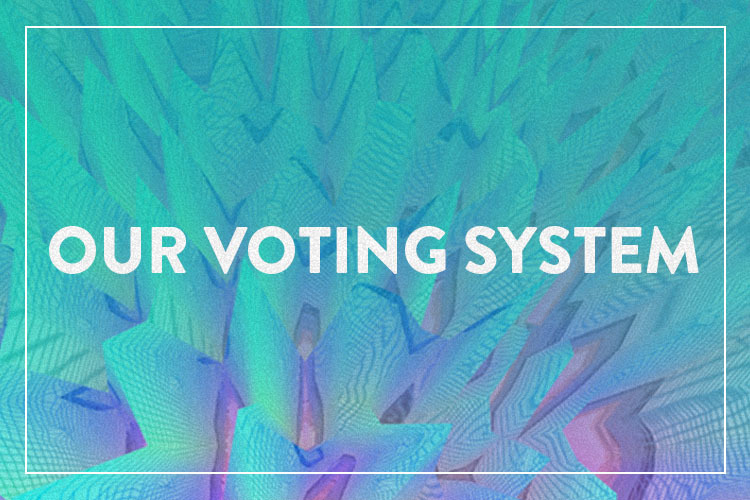 You asked: Where did we get our voting system from? How is it possible to win the elections and not win the popular vote? What does winning a seat even mean? You asked: How do voters impact policy? How does politics 'flow' from the voting process onwards? What happens before voting? What happens after voting? Why does voting even matter? If I just focus on my work, isn't that good enough?